Readers of StackOfStuff may recall the NASCAR fantasy league that some friends and I started last year. Well, we're at it again this year and I'm having a great year! I'll start keeping track of the league again here. One sad thing is that Mike McCaskill is still a member of the league but is unable to participate because of his battle with the brain tumor. I'm managing it for him this season. We're thinking of you Mike during the race! Great news for Dunkin Donut fans! A New York City franchisee and development group plans to bring new Dunkin' Donuts restaurants, a corporate headquarters, and up to 1,000 jobs to the Upstate. Kainos Partners LLC plans to open Dunkin' Donuts on U.S. 25 in Travelers Rest, on North Pleasantburg Drive in Greenville and in Liberty, according to Bart Thorne, Kainos president and chief operating officer. He said it's part of an agreement Kainos has to develop 37 new Dunkin' Donut prototypes throughout the Upstate, including Greenville, Spartanburg, Anderson, Clemson, and Seneca. Being the big fan that I am, this is good news. The one on Pleasantburg might actually be closer to me than the current one on Wade Hampton. Of course, I am not a big doughnut fan. I rarely buy donuts - from DD or Krespie Kreme. I love DD coffee! You know... in order to celebrate this news, I think I'm going to go buy me a cup. Today I registered to ride in the Palmetto Peloton Project. Last year was my first ride. It was my first metric century. This year the ride takes on new meaning. My friend, Mike McCaskill, has been battling cancer since that time. Now I have a greater reason to help raise some funds for cancer research. Thank you for accepting the challenge to be a part of the 2007 Palmetto Peloton Project! This year’s event is themed the Stars and Stripes Challenge. We challenge you to be courageous, be bold and be strong! Conquer the route of the US Pro Cycling Championship while helping to support cancer advocacy and research initiatives. Over the last two years, with the help of cyclists like you, the Palmetto Peloton Project has raised over $100,000 for cancer research and advocacy efforts. We are grateful for your efforts to solicit contributions for this meaningful cause. With your help, the Palmetto Peloton Project can reach the 2007 fundraising goal of $165,000. Proceeds will support the Lance Armstrong Foundation and the Oncology Research Institute of the Greenville Hospital System. The Lance Armstrong Foundation is committed to providing tools and resources that people living with cancer need to LIVESTRONG. The Oncology Research Institute is embarking on cutting edge cancer research. With your help, we will support these organizations in their continued efforts to make a difference in the fight against cancer. The battle against cancer is significant and grows everyday. This year, more than 1.3 million Americans will be diagnosed with the disease. One in three people will be diagnosed with cancer in their lifetime. We are passionate about our efforts to support cancer advocacy, education and research. Our cause is important and we believe that we can make a difference in the lives of those battling cancer today and the lives of those who are diagnosed with cancer tomorrow. The Palmetto Peloton Project is a 501 (3)(c) organization. Please visit the P3 website at www.P3ride.org for resources and tools to help you raise funds for your challenge. This year we have added on line donation options for your sponsors and hope to keep you informed up to the minute on your fundraising efforts! Thank you again for supporting the Palmetto Peloton Project! GASPERS, Kevin J., 26, First Lt., Army; Hastings, Neb. ; 82nd Airborne Division. KING, Jerry R., 19, Specialist, Army; Browersville, Ga.; 82nd Airborne Division. KNOLL, Garrett C., 23, Pfc., Army; Bad Axe, Mich.; 82nd Airborne Division. LOCKER, Kenneth E. Jr., 28, Staff Sgt., Army; Wakefield, Neb. ; 82nd Airborne Division. MARESH, Jeremy E., 24, Specialist, Army; Jim Thorpe, Pa.; First Battalion, 213th Air Defense Artillery. MARSHALL, Randell T., 22, Sgt., Army; Fitzgerald, Ga.; 82nd Airborne Division. MOORE, William C., 27, Staff Sgt., Army; Benson, N.C.; 82nd Airborne Division. PEARSON, Brice A., 32, Sgt., Army; Phoenix; 82nd Airborne Division. RODRIGUEZ, Michael J., 20, Specialist, Army; Sanford, N.C.; 82nd Airborne Division. VAUGHAN, Michael L., 20, Sgt., Army; Otis, Ore.; 82nd Airborne Division. The deaths raised to 85 the number of U.S. service members who have died in Iraq in April, making it the deadliest month for American troops since December, when 112 died. Wednesday evening at Clemson University there was a candle-light vigil for those who died during the attack at Virginia Tech. At the vigil a Clemson student organized the signing of a banner that he planned to take up to VT this weekend. The banner signing made the local news here. A Bob Jones University student saw the gesture and thought it would be good for students at BJU to do the same. So, he contacted the student at Clemson to see what they planned to do. It was decided that the BJU student would get a banner and organize a signing on the campus. He would then give it to the Clemson student to deliver along with his school's own banner. As was said at Clemson last night, "Today, we are all Hokies." A nice 17 foot long banner was designed and created. 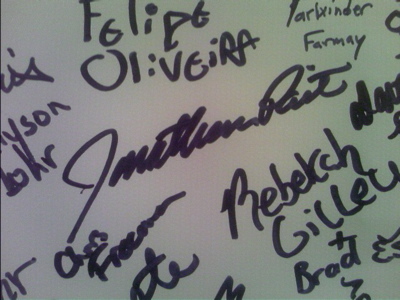 Thousands of students, faculty and staff, and visitors to the campus signed the banner. It was great to be a part of the project. 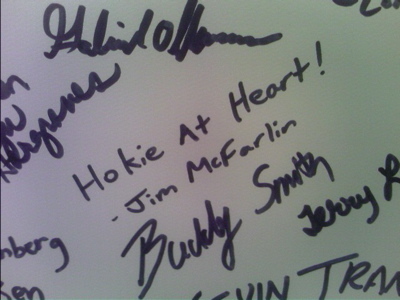 Here's hoping it will bring even a small hug of comfort to the university family at Virginia Tech. I was glad to add my own name to the banner. In closing, I have to say I have been very impressed with the response from the students at VT and the parents of the victims. Truly, today, we are all Hokies. A law enforcement official described it Tuesday as a typed, eight-page rant against rich kids and religion. The official spoke on condition of anonymity because he was not authorized to speak to the media. "You caused me to do this," the official quoted the note as saying. Cho indicated in his letter that the end was near and that there was a deed to be done, the official said. He also expressed disappointment in his own religion, and made several references to Christianity, the official said. I wonder where this will lead? It appears that he must not have claimed Christianity based on the wording of the official. However, I will be curious to see what references he made to Christianity. How could the teachings of the Bible be viewed from that type of mind? I don't propose to know the answer. Obviously, he did not see the hope found in the Gospel. Then again, what Christianity did he see? Was it a reality in the people he came into contact with, or was it merely a part of the traditional culture? I guess we'll find out as we learn more about his past. One thing is certain. It causes me to rethink my own interaction with others. Can we simply let people go who appear to be having obvious struggles? "It isn't my business," we say. Then again, should someone's struggles take him or her to the extremes exhibited by Cho, it becomes everyone's business. I rode about 300 miles on a trainer this winter. I watched episodes of 24 on my iPod (I have one of those neat 7 inch screen thingies) while I churned away. I also downloaded some of the Carmichael training podcasts and videos. The plan was to hit the road this spring better than I was before winter began. It didn't happen. The amount of time you would have to put in on a trainer in order to increase your ability over the winter would be so much you wouldn't have time to do anything else! However, that being said, I'm glad I did it. Why? Because, as my wife tells me, "Not going backward can be just as good as going forward." Now a month into riding, I am at the place where I was after several months training last year. Riding the trainer didn't get me ahead -- unless you consider not getting behind getting ahead. 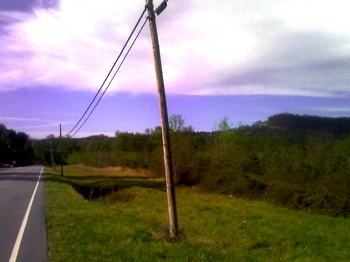 A shot looking down Old Buncumbe Road with Paris Mountain to the right. Today I did my first trip up the backside of Paris Mountain. I rode up the frontside last week, but today I pretty much followed the USA Pro Cycling Championship route. Since my allergies have been bothering me, I decided not to push too hard. I set out and reached the base of the mountain with a 16.5 average. 14.5 miles and exactly one hour after leaving my house, I was at the top. The following letter to the editor appeared in today's The Greenville News. There are several misrepresentations in the piece (for instance, the three individuals from the group did not ask permission to come on the campus to discuss homosexuality and the Bible), but that isn't the point on which I would like to comment. Could we meet BJU's standards? The calendars of two great religions were in alignment as Christians observed Holy Week, leading up to Easter, while Jews were celebrating Passover, a reminder of mankind's continuous struggle for freedom. In the middle of this week of intense religious focus a busload of representatives of Soulforce arrived in Greenville. Soulforce, dedicated to freedom from religious and spiritual violence against lesbian, gay, bisexual and transgender people, was here to visit Bob Jones University. However, our BJU neighbors drew back their welcome mat and actually caused three individuals from the group, which had asked permission to come on campus to discuss homosexuality and the Bible, to be briefly arrested for trespassing. BJU explained, "We intend to defend Scripture as the Christian's authority for life and belief." This incident provides a textbook case asking the question WWJD (what would Jesus do)? The supporting presence to Soulforce by my good friend Rev. Donna Stroud was probably as compassionately correct a response to that question as anything said that day. I'm not sure WWJD, but to be consistent with BJU philosophy my modest proposal to that institution of higher learning is that at a minimum their entrance gate guards have a full list of high-profile biblical moral offenses that would bar any visitor from entry to their grounds, including do you honor your father and mother, not murder, commit adultery, steal, lie or covet? I realize this policy might severely restrict the number of admissible campus visitors, but at least BJU would be more properly defending Scripture. Then let's search our own consciences; could we meet those entrance standards? First, it should be pointed out that the group was not kept from entering the campus because they are homosexual. Had the individuals of the group wished to come to the campus to visit the Museum and Gallery at Bob Jones University, attend an arts program, or chapel they would have been welcomed. It was the activist organization and its intent that was refused an invitation. So, right off the bat, the writer's premise is unfounded. Had an activist organization seeking to promote adultery, hooking up, dishonoring your mother and father, or any of the other issues the writer mentions approached the school in this way, they would have been met with the same response. Believe me, there are plenty of sinners at BJU. I know there is at least one because I am there. Perfection is not a prerequisite for entry. The greater question is "Can we meet God's standards?" "What would Jesus do?" The writer asks. Well, what did Jesus say? He didn't just speak out against sexual sins -- He said that even if a man lusts in his heart he was guilty of sexual sin. He didn't just speak out against murder -- He said that if you have hatred in your heart for someone, you have murdered. Certainly, He ate with "sinners and publicans," but as much certainty He did not condone their sin. Bottom line, we can't meet God's standards. We are all sinners in need of a Saviour. Jesus was the salvation for each of those "sinners and publicans" who sought Him. He made the standard incredibly high for us and then He turned around and met that standard for us. The only thing we need to do is accept that salvation and when we do, it changes our lives. What should be our response? Because of what He has done for me -- He took my place. He bought me with a price. He "owns" me. -- I should seek to live a life as close as possible to His character. How do we know that character? It is through His revelation of Himself to us -- the Bible. How can that desire be put into practice in this case? We recognize that God in the Bible defines homosexuality as sin. I should not view someone caught up in that sin any differently as I would someone who is a glutton or a gossip. At the same time, I cannot take part in something that would positively promote homosexuality, gluttony, or gossip. Most of all, I must search my own heart and ask, "Jesus, if you see any wicked way in me, please forgive me and give me a heart that will seek to lead me to a life consistent with Your character." Of course, I have no idea what the administrators are thinking. I told him as much but then offered what I am hearing as I talk to South Carolina evangelical Republicans. Since I didn't give him what he was after, it probably won't come up in his article. Just in case, I'm placing my comments here to see how they compare with what gets published. 1. Most likely Rudy Giuliani's biggest obstacle with evangelical Republicans in South Carolina will revolve around the ideological differences on the social issues such as abortion and gay civil unions. Even those attracted to his candor, explanations of his fiscal policies, and handling of New York during 911 will find it hard to back someone who is sympathetic to the liberal view of those two issues. He is probably wise to play up his desire to appoint strict constructionist judges. 2. What I am hearing is that Mitt Romney's more liberal past would have a greater bearing on his campaign than his Mormonism. Certainly, there is an expression of concern among some because of his religion, but I also hear others say, "We are electing a CEO - not a pastor." Romney will need to do a good job convincing evangelical conservatives that his political transformation over the years is indeed genuine. If he can do that, he may find some traction among a large faction of those voters. Let me throw in number three :-) There is also a rumbling from those who are not satisfied with any of the current field. They desire to find someone who fits their ideology without concern to that candidate's "viability." If the rumblings represent a sizeable number, then the primary could be a very fragmented affair. If that happens, it could mean a toss up for a primary winner. We'll see what happens and if I get any more of these, I'll pass them along.